Doyon Foundation celebrated our fall 2014 recipients at a scholarship award ceremony held in Fairbanks on September 5. More than $214,000 in competitive and basic scholarships were awarded to 239 students this fall. The ceremony also provided the opportunity to recognize the donors whose support make our scholarships possible. Donors are listed on the Doyon Foundation website at http://www.doyonfoundation.com. Approximately 50 Foundation staff, board members, students and supporters were in attendance, including Geri Simon, senior vice president of administration at Doyon, Limited; Chris Simon, rural education coordinator and Doyon, Limited board member; Wally Carlo, Doyon, Limited board member; Joshua Peter, Foundation board member; Evon Peter, University of Alaska Fairbanks (UAF) vice chancellor for Rural, Community and Native Education; and Annette Frieberger, UAF Rural Student Services director. Diloola Erikson, our 2014 natural resources competitive scholarship recipient, gave the keynote address, speaking about her experiences as a student at UAF, where she is pursuing her bachelor’s of science in mechanical engineering. Scholarship recipients in attendance had the opportunity to introduce themselves during the ceremony, which concluded with mingling and refreshments. Don’t miss out for a $500 financial award for Spring 2014! 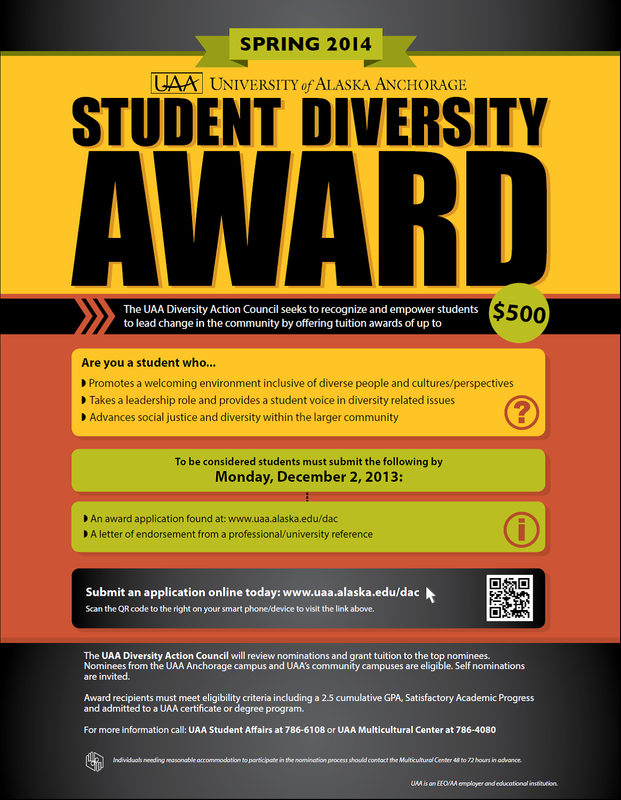 Apply for the $500 Diversity Award! 58,693 + 5,750 + 124 + 50 + 28 = 64,645. That’s the number of reasons Doyon Foundation has to be thankful for this year’s Morris Thompson Memorial Golf Classic, held June 13 and 14 at Chena Bend Golf Course in Fairbanks. A total of $58,693 was raised at the event, which is the Foundation’s largest annual fundraiser. Proceeds from the classic support the Morris Thompson Scholarship Fund, an endowed fund benefitting Alaska Native, higher education students studying business management and leadership. This year’s proceeds were just slightly lower than last year’s total of $59,515. Funds were also raised for the Foundation’s health competitive scholarship fund, which was established in 2011 with the support of a Rasmuson Foundation matching grant, plus the donations of numerous corporate and individual sponsors. Tanana Chiefs Conference presented a $5,000 donation at this year’s classic and challenged participants to contribute toward it as well. An additional $750 was raised for the health scholarship fund, for a total of $5,750. The Foundation saw an increase in the number of golfers this year, with 124 players hitting the greens in support of scholarships. The first place team was comprised of Lane Keator, Howard Thies, Gene Carlson and Don Castle. See the full list of winners here. The Foundation was honored that U.S. Congressman Don Young attended the 2012 golf classic. In addition to playing in the tournament, the honorary event host also spoke at the Calcutta on Thursday evening. The event would not be possible without the generosity of the 50 sponsors, who contributed everything from significant financial donations to door prizes. A special thank you to this year’s Doctorate Level sponsors, the Doyon Family of Companies, KeyBank and Key Equipment Finance, and Master’s Level sponsor Premier Earthwork. See a full list of sponsors here. The dedicated group of volunteers was also key to the event’s success; 28 individuals donated their time in support of this year’s classic. View a list of volunteers here. They were honored at a volunteer appreciation lunch on Friday, August 3. More than a dozen door prizes were given out. Volunteer Mariah Pitka went home with 40,000 Alaska Airlines miles donated by Doyon, Limited; Geri Simon won a one-year pass to the University of Alaska Museum of the North; and Lori MacCafferty received an overnight stay at the River’s Edge Resort. The golf classic, established in 2000, is held in memory of the late Morris Thompson, who served as the president/CEO of Doyon, Limited from 1985 until his passing in 2000. Read more about the classic here. Jennifer Maguire is a Doyon Foundation alumna, as well as a current student. She earned her bachelor’s of arts degree in English with double minors in applied business and Alaska Native studies from the University of Alaska Fairbanks (UAF) in 2004. She is currently enrolled in the MBA program at the UAF School of Management and will complete her master’s of business administration in December 2013. Jennifer shared that she has experienced setbacks throughout the years, but many turned out to be positive. “About two years ago I reached a plateau in my career and realized that I needed to go back to school in order to increase my earning power. I have a daughter who will be starting college in about a year and as a single mother, I knew I needed to earn more money in order to help her pay for school. I decided to pursue a graduate degree and now I have three more classes until I earn my MBA! Sometimes when one door closes, another one opens,” Jennifer says. ve dropped my classes. I am very grateful for that scholarship, which has helped me get where I am today,” she says. Jennifer has served the people of Interior Alaska for more than 20 years through her work at various Native organizations in Fairbanks. She was promoted to CEO of the Interior Regional Housing Authority (IRHA) in September 2012, after working in grants and compliance at IRHA since July 2011. Prior to that, she worked in the legal department at Doyon, Limited and is a graduate of the Doyon Management Training program. Other work experience includes human resources intern and recruiter at Doyon, and grant writer at Tanana Chiefs Conference. Jennifer is also active in the community. She served as a Doyon Foundation board member from 2005-2008, and currently serves as a mentor “big sister” in the Big Brothers Big Sisters program. In her spare time, she enjoys golfing and spending time with my family. Jennifer is originally from Allakaket and has lived all over Alaska, as her parents were teachers. She is the daughter of Cora and the late Bob Maguire, and the granddaughter of Johnson and the late Bertha Moses of Allakaket and the late Hugh and Irene Maguire of Lake Chelan, Wash. She has a younger sister, Gail; a younger brother, Jeremy; and a 16-year-old daughter, Navonne. The AIGC All Native American High School Academic Team (ANAHSAT) honors 10 American Indian and Alaska Native high school seniors each year. High school seniors with outstanding academic achievements, leadership in school, civic and extracurricular activities and motivation to serve and succeed should apply. • Be a high school senior at time of application. The deadline is March 16, 2013. To apply online, click here. You may also visit the AIGC website at aigcs.org. To enter the Online Application System, click the APPLY NOW button found in various places on the AIGC website. All inquiries regarding this program should be directed to fellowships@aigcs.org. Please see the attached information about the nomination process for the 2013 Kay L. Thomas Pathfinder Award. Please contact Cathy Brooks at cabrooks2@alaska.edu with any questions. 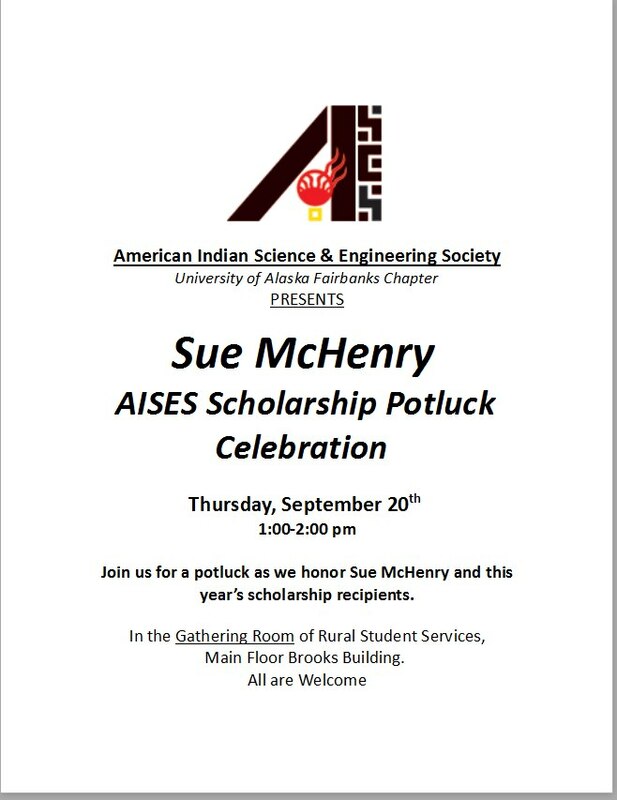 AISES is holding a potluck on Thursday at 1pm in the UAF Rural Student Services Gathering room to celebrate the newly named AISES Scholarship for Sue McHenry. See flyer below for details.